Best hostel! Best island! Had so much fun here. Really clean and well kept hostel and the rooms are lovely. Helpful staff. Only wish there was a pool! 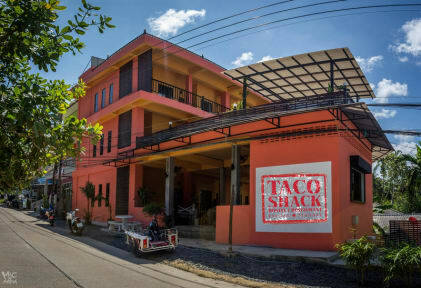 I really enjoyed my stay at Taco Shack. Very chill atmosphere, nice facilities and an incredibly helpful staff. Great hostel! It was a really fun party hostel and also a great place to chill during the day. Clean beds, lockers, good food and cheap drinks! If I ever come back to Koh Tao I'll definitely be staying here again. Great spaces to chill out and meet other people, and not far from Sairee beach (although in the heat of the day the hill can be tough). Staff were very helpful and friendly and the rooms clean and secure. Definitely try the mango chicken tacos! Food and drinks here were sort of expensive but that’s the case for most of the area - there are some good cheap restaurants on the road to the beach though! This hostel is in a good location for Sairee Beach and the bar crawl. WiFi is good but hot water is temperamental. The atmosphere is questionable; on my first night there was no atmosphere whatsoever however on nights when the choppers bar crawl isn’t on it seems to be much more sociable.